Counter-Measures, the audio series centred upon an elite group that investigates dangerous technologies and alien incursions, will return in July 2013 for a second series of four brand new hour-long episodes. The spin-off from the Seventh Doctor TV tale Remembrance of the Daleks stars Pamela Salem as Rachel Jensen, Karen Gledhill as Allison Williams and Simon Williams as Group Captain Gilmore while Hugh Ross is the organization’s shady boss, Sir Toby Kinsella. Episode one is Manhunt by Matt Fitton, in which Group Captain Gilmore is on the run and suspected of murder. The guest cast includes Lucy Fleming as Lady Waverly, as Captain Astor and Gemma Whelan as Emma Waverly. The team heads underground for episode two, The Fifth Citadel by James Goss, investigating a hidden wartime bunker beneath London. The third episode, Peshka by Mark Wright and Cavan Scott, takes Counter-Measures to Holland for an international chess championship, where the contest takes on a deadly significance. The series ends with Sins of the Fathers by John Dorney, which follows the consequences of a tragic death at a funeral… one that will have major repercussions for Counter-Measures. Tom Price plays Father Ellard, while Philip Pope is Templeton, Sir Toby’s trusty assistant. 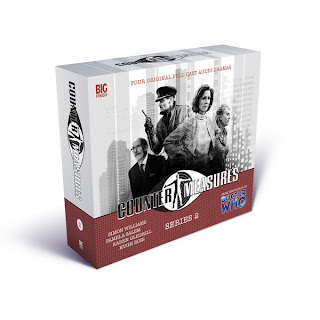 The five-disc box set includes an hour-long behind the scenes documentary, including interviews with cast and crew. July 2013 does seem quite a way off at the moment, although I'm already allowing myself an early glimmer of anticipation for this second series, having thoroughly enjoyed the first. I'm sure there'll be much more to mention nearer the time of release, including details of my own involvement in the production.